Resembles Greater Short-toed Lark though slightly smaller, with shorter, more stubby bill, more distinctly streaked breast, no black patches at sides of throat, shorter tertials with wing-tip clearly exposed beyond (beware of Short-toed with worn tertials) and typical flight-call different. Upperparts generally sandy grey, pale buff or rufous-brown, crown usually not tinged rufous; supercilium generally less noticeably than in Short-toed; for separation of juvenile see Short-toed (but attains adult-like plumage quickly from Aug–Sept). 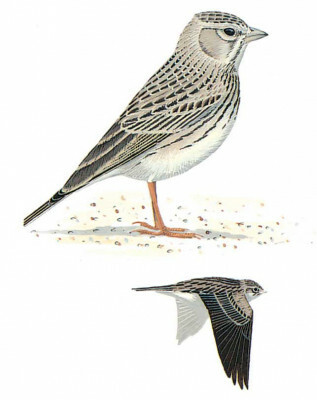 Told from most other small larks by more streaked upperparts and much white at sides of tail. In winter may occur in small dense flocks like Short-toed.